Halloween is not a day, you know. This year, it's a four-day weekend. 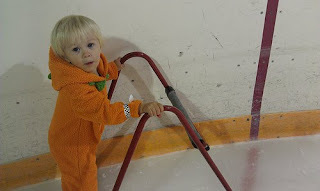 Friday night, we dug the ice skates out of the crawl space, put on costumes and went to the Halloween Edition of Friday Night Family Skate. I hate ice skating, but it was worth it for this picture. 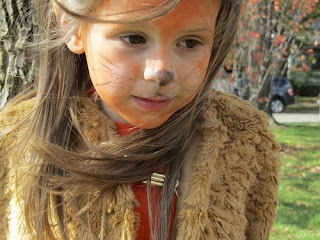 Today, Pebbles had an in-costume birthday party at 10:30 a.m. As soon as I dropped her off, I took Nutmeg and Toth downtown for trick-or-treating to businesses. Epu made the kittycat costume Pebbles is wearing. 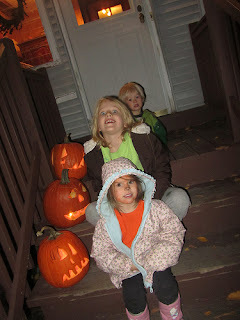 Then after the little ones went home to nap and Nutmeg and I had hit the gym for swimming lessons and rock climbing, the kids carved pumpkins with dad. We're not the only family in America who did that tonight, either. I know this because "pumpkin seed recipe" is the No. 17 most popular search on Google tonight. Here's the one that's baking at our house right now: Spicy Roasted Pumpkin Seeds. This was the year for pumkins - me I am all pumpkined out. Had the pumkin at my house, a pumpkin contest at the school I work at... pumpkin sale at church. so glad it's only once a year.